I don’t often eat out at the Mailbox, but Mark and I recently enjoyed a delicious dinner at Tom’s Kitchen in Birmingham. 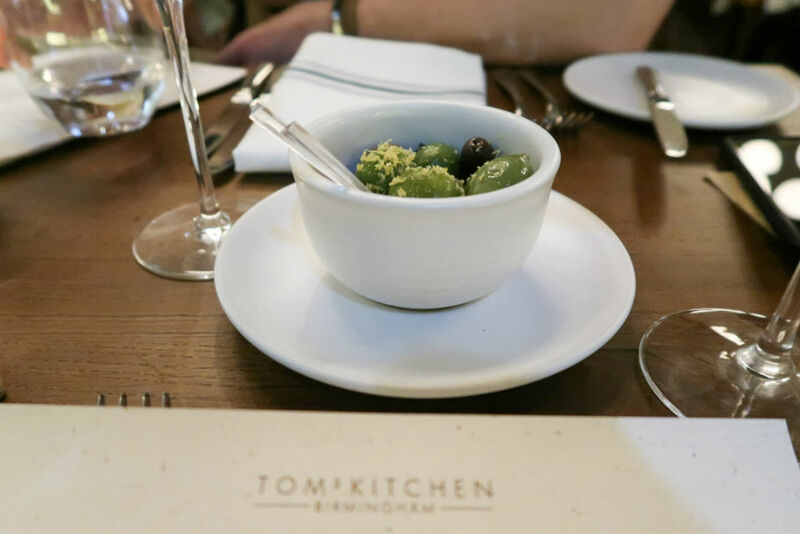 Disclosure: I was invited to dine as a guest of Tom’s Kitchen Birmingham. The opinions below are my own and unbiased. Confession time. Although I go regularly to Birmingham for shopping and to eat out, I don’t often head over to the Mailbox. When I do go over there, I’m always left wondering why I don’t spend more time in that part of the city. So when I received an email inviting me to visit Tom’s Kitchen in the Mailbox, it sounded like a fantastic idea. Tom’s Kitchen Birmingham is one of the restaurants, delis and bars opened by Tom Aikens. It is located in the Mailbox near to Harvey Nichols and had a lovely relaxed atmosphere when Mark and I arrived. We were seated near to the pass, and our waitress soon came to take our drinks order. She also asked if we’d like any olives while we looked at the menu, which sounded like a good idea. I’m a bit of an olive fan and these were particularly delicious, topped with fine lemon zest. 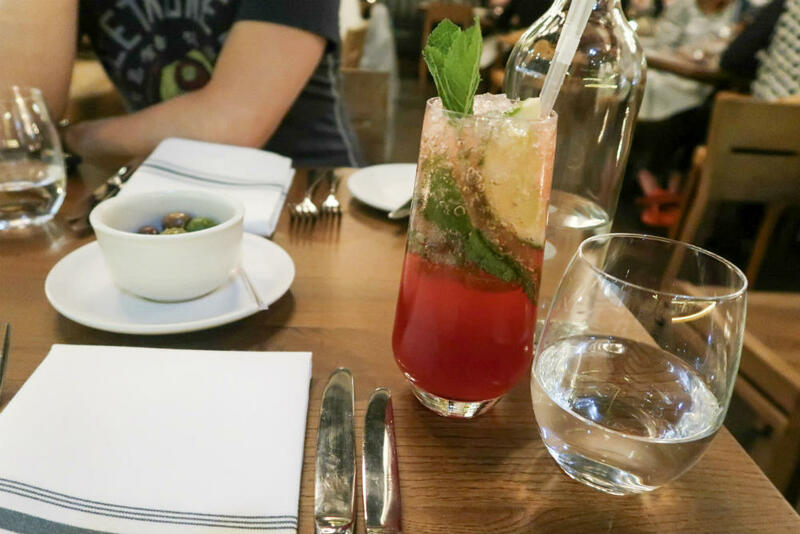 It was Mark’s turn to have an evening off from driving, so he enjoyed a glass of Pinot Grigio while I opted for the Berry Mojito. Mocktails can sometimes be overly sugary, but this one was really delicious. The mint, lime and cranberry helped to balance out the sweet berry flavours. I certainly didn’t feel that I was missing out by having an alcohol-free evening. Tom’s Kitchen has a pretty well-stocked bar, and they also offer a bar menu if you’re just after a quick lunch or snack to go with your drink. There are a range of smoothies and milkshakes available, as well as wines, beers and cocktails. Tom’s Kitchen also has a pretty extensive Weekend Brunch Menu, including everything from a full English or Truffle Eggs Benedict to Seasonal Berry Pancakes and Superfood Granola. And you can toast the weekend with a selection of drinks including champagne, Bloody Mary’s or a Potassium Kick juice. I love having brunch in the city, and I’m very tempted to head to Tom’s Kitchen next time! Back to the Dinner menu. Mark and I decided to forego starters, to make sure that we had room for pudding at the end of the meal. But the restaurant has a great selection of starters on the menu, including Spicy Crab Cake, Homemade Ricotta with Sourdough, and Pickled Cornish Mackerel. I opted for the slow roast belly pork, which was served with choucroute, smoked sausage and a pork jus. The belly pork was melting-soft, and the crackling was crispy. 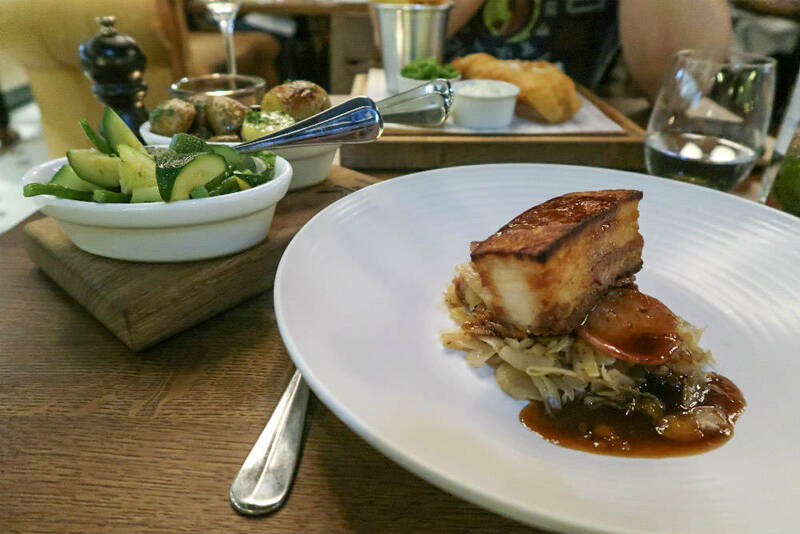 The sweet/sour flavour of the choucroute really cut through the fattiness of the belly pork – absolutely delicious! To go with my pork, I ordered a portion of heritage potatoes and a portion of season vegetables. The portion sizes were pretty generous, and the vegetables were cooked pretty much to perfection. Meanwhile Mark chose the Fish and Chips. 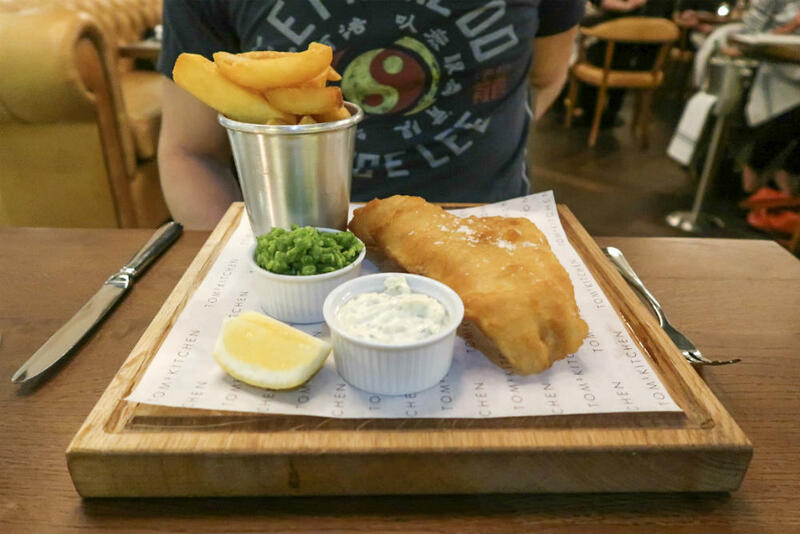 The fish was coated in crispy, light batter and there was a portion of triple-cooked chips alongside. I couldn’t resist stealing one of those…well, maybe more than one – they were insanely good! But we were both surprised by how delicious the crushed peas were. It’s not often that you come away from a restaurant raving about the peas, but these were so incredibly sweet and fresh-tasting. I actually wished I could have ordered a portion to go with my pork! Of course, we made sure to save room for pudding! 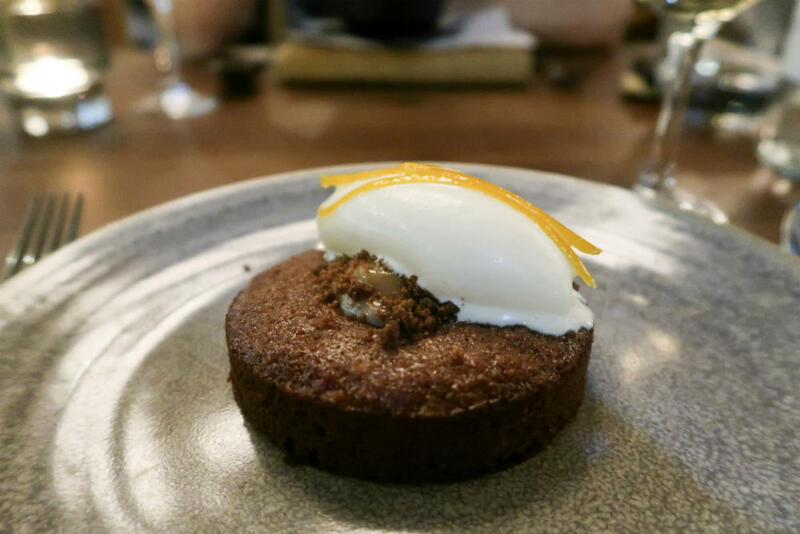 Mark really enjoyed his Chocolate and Peanut Butter Fondant, while I picked the Dark Treacle Sponge. That kind of pudding can easily be too heavy and stodgy, but Tom’s Kitchen gets it just right. It’s dark and sticky with orange syrup, condensed milk, and golden syrup ice-cream. I could happily have eaten another one afterwards! Our meal was free of charge, but the bill for our meal would usually have been just over £70. I think it represents pretty good value considering the standard of the food, the relaxed surroundings and the excellent service. I get the feeling that I’ll be heading back to the Mailbox a lot sooner next time. 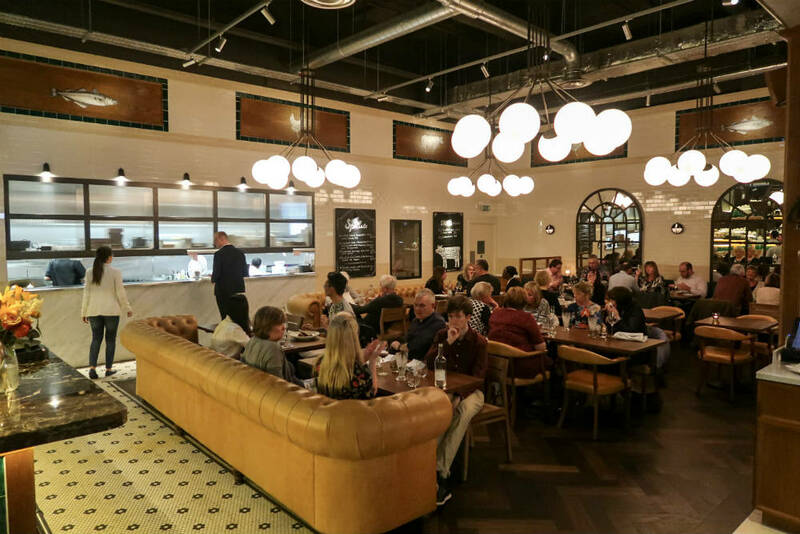 Thanks to Tom’s Kitchen Birmingham for a wonderful evening – I’m sure we’ll be back very soon! The food looks really nice. Even if they are simply pub recipes, the presentation is very nice. I like the sound of your main, with the soft meat and crunchy crackling. The mailbox sounds like a nice place to go for dinner, it sounds like you had a wonderful and tadty meal.